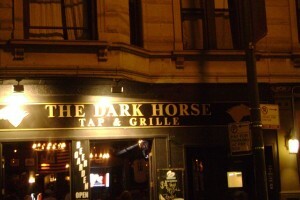 While Dark Horse calls itself an English pub, it’s more than that, considering they have $1 Taco Wednesdays, among other non-British food specials. Plus, even when the Wrigleyville crowd at Dark Horse Tap spills outside into the front and back beer garden, patrons can still watch the game — especially the Steelers during football season — thanks to the large open doors and windows. Another plus to this Wrigleyville Bar? Even though Dark Horse isn’t far from Wrigley Field, just off Clark Street, it has a more relaxed atmosphere than the other bars and clubs you’ll find in the area.